﻿National and international experts, academicians, researchers, civil society organizers are expressing their concern that changes in the river network of Bangladesh is being evident day by day. An expert workshop on this issue has stressed the need for scientific and informed research on this field. The workshop titled 'River Navigation and Inland Shipping in Bangladesh: Economic Importance and Impacts of Environmental Change' was held in the CARS Auditorium of University of Dhaka Saturday. It was jointly organized by Vanderbilt University of USA, University of Dhaka, Riverine People, Independent University of Bangladesh (IUB), and International Centre for Climate Change Adaptation and Development (ICCCAD). 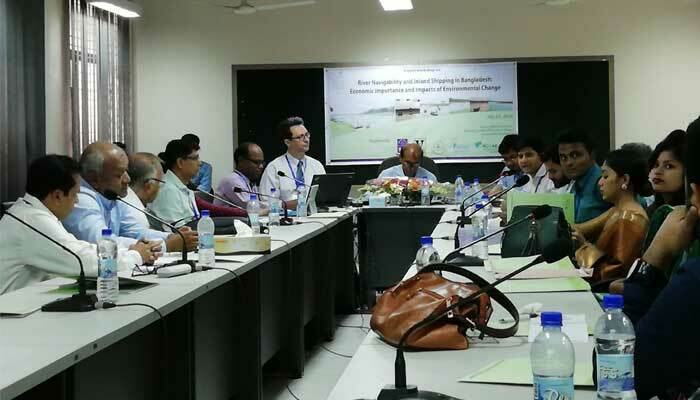 The workshop brought experts, relevant government official, scientists, engineers, academicians, researchers, and civil society organizers together to understand the river navigability and inland waterways of Bangladesh. They focused on its economic importance and environmental changes. Inaugurating the workshop, Chairman of National River Conservation Commission of Bangladesh Dr. Muzibur Rahman Hawlader said that country needed this kind of knowledge sharing workshop more. He said the present government under the leadership of PM Sheikh Hasina was dedicated and determined to revive the waterways. The workshop was moderated by Dr. Masu Pervese Rana, Chairperson of Riverine People and teacher of Rajshahi University. Eminent water and river expert and Professor Emeritus of Brac Universiy Dr. Ainun Nishat, former secretary of BIWTA Syed Monowar Hussain, Professor of Geography and Environmental Studies of Rajshahi University Dr. Rejaur Rahman, Program Director of Oxfam in Bangladesh M. B. Akhter, Secretary General of Riverine People Sheikh Rokon joined the workshop as resource persons. Two researchers on this issue from Vanderbilt University, Associate Professor of Earth and Environment Science Dr. Jonathan M. Gilligan and Assistant Professor of Civil and Environmental Engineering Dr. Hiba Baroud attended the workshop. Dr. Bishawjit Mallick, Research Fellow at Vanderbilt University and Faculty of Environmental Science at TU Dresden of Germany coordinated the workshop. Stressing the need of understanding rivers of Bangladesh Professor Ainun Nishat said that by building embankments the ecological relation between river and embankments had been being cut off. He termed it as adverse to the environment. He suggested to revive the navigability in a sustainable manner. Dr. Jonathan M. Gilligan sees that proper management of riverine land can help Bangladesh to adopt and survive better with sea level rise and climate change. On the other hand poor management can create more hazards. Dr. Hiba Baroud feels that Bangladesh will definitely need to open up more channels for the better management of waterways. To improve the situation, they will need to improve the dredging techniques. This kind of decisions cannot be made without scientific and informed research, she adds. Sheikh Rokon, Secretary General of Riverine People, told Samakal Online that reviving historical waterways of Bangladesh could change the geopolitical paradigm of the South Asia. It will not only establish the better connectivity among the countries, will also bring better maintenance for the major waterways. Among others, Md. Nadiruzzaman of IUB, Md. Altaf Hossain of Islamic University, Mohammad Azaz of Riverine People, Muyeed Hasan of SUST Sylhet, Mihir Biswas of BAPA, Md. Alauddin of River Research Institute, Md. Mashiur Rahman of BUET, Mohan K. Das of IWFM took part in the discussion.